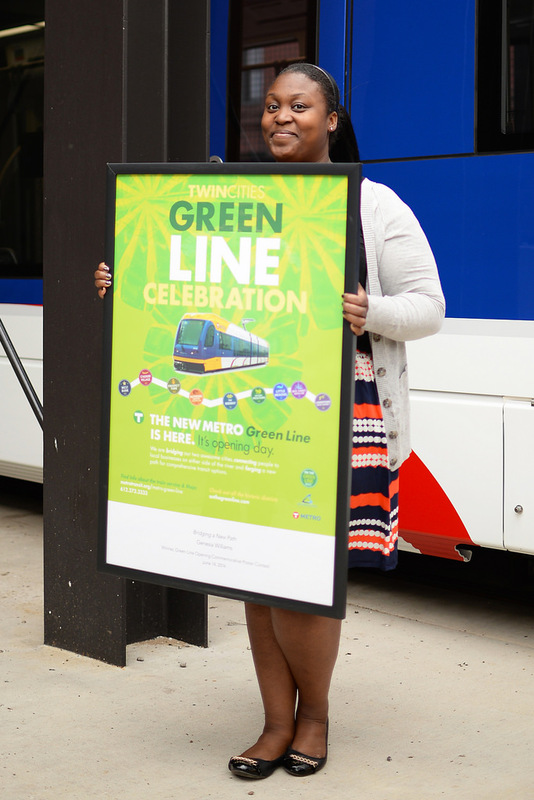 When Genesia Williams heard about the METRO Green Line Opening Day Poster Contest, she knew immediately that she had to enter. A graduate of the Minneapolis Community & Technical College’s graphic design and print program, Williams wanted to gauge how others responded to her work, and saw the contest as an ideal opportunity. Turns out people responded quite favorably. On Thursday, June 12, Williams’ design – a vibrant green featuring an abstract collage of light-rail vehicles – was revealed as the contest’s winning entry. The contest drew 47 entries that were narrowed down to five finalists by a group of community members from neighborhoods along the Green Line and then put up for a public, online vote in May. To recognize her efforts, Metro Transit General Manager Brian Lamb presented Williams, 27, with a $500 check and a Go-To Card good for a year’s worth of bus and train rides outside the Green Line’s Operations and Maintenance Facility in Lowertown St. Paul. She will also receive a framed copy of the poster. More importantly to Williams, her work will be viewed by tens of thousands of people who attend the Green Line’s grand opening. Postcard-sized copies of the poster will be distributed at stations and a limited number of larger copies will be available on Metro Transit's store. Surrounded by her family, Williams said she was elated to have a part in the history-making opening and that the poster "resonated with the people that the work was there to serve." “I’m so excited I can’t even contain it,” she said.